Chartham Hatch Pit is designated as a RIGS site because it contains the type locality for the Chartham Flint and potentially the International Stage Boundary. 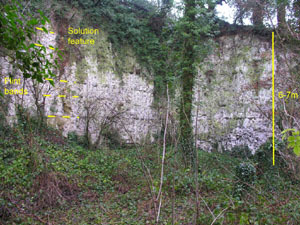 At a local level it is the only remaining pit in this part of Kent that exposes this interval of the chalk and thus provides a link between the coastal sites and those of the Medway Valley region, for example, the RIGS at Cliffe Pools. Chartham Hatch Pit is a small abandoned and partly overgrown chalk pit to the southwest of Canterbury and south of the village of Chartham Hatch. It provides a section through the soft flinty chalks of the middle part of the Micraster coranguinum zone of the Upper Chalk. The pit is the type locality for a distinctive bed of large, lensoid flints known as the Chartham Flint. 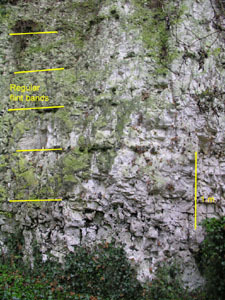 This together with other distinctive flints and marl bands is used for correlation of chalk sequences throughout the Anglo-Paris basin. Above and below the flint are two thin levels containing the large wavy bivalve Cladoceramus undulatoplicatus. These levels are thought to be of world wide extent. The lower will probably be taken as the international base of the Santonian Stage of the Upper Cretaceous with its type section at Ten Mile Creek south of Dallas, Texas. Permission to visit must be obtained from the owner. Access is relatively easy as the road is adjacent. There is parking for one car. Special care must be exercised when visiting the quarry as the faces are vertical and there is the risk of falling debris. 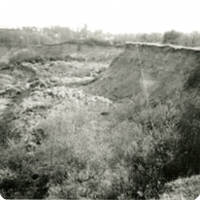 The quarry floor is uneven under foot and is moderately vegetated.